Granite Gold is the stone care expert. Caring for your natural stone surfaces such as marble, granite and quartz requires special products that do not scratch the natural surface, doesn't leave streaks, yet still gets that deep clean you desire. "Consumers are becoming increasingly aware of the damage caused by everyday household cleaners on granite and other natural stone surfaces. Specially formulated to clean and maintain natural stone and quartz surfaces, Granite Gold’s complete stone care system gives you the tools to keep your natural stone protected and looking great." Granite Gold Daily Cleaner is biodegradable, fresh citrus scent, non toxic and non streaking. Hard to find in a stone surface cleaner. A product we can trust around our food surfaces and young children. Granite Gold Polish helps give a luster to your dull counter tops, without compromising the safety of the food surfaces. Used weekly along with the daily cleaner, your counters will build up a natural resistance to hard water stains and fingerprints. I am hoping to redo my kitchen in the future and am looking at granite countertops. I am so glad that I already am aware of a product that is going to keep my countertops looking new. I have used this product on the tile in my bathroom and it has a nice clean scent, a nice gentle clean, and is easy to use. Visit Granite Gold on Facebook for project ideas and up to date products. 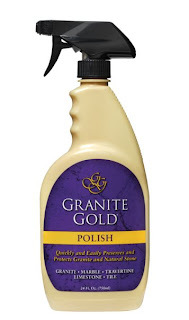 Enter to win Granite Gold's top products! Daily Cleaner and Polisher!! Use the rafflecopter for entries. USA only. Ends Aug 10th. The outdoor stone cleaner for my patio. The disinfecting wipes for my counter.